Latkes, the Jewish version of potato pancakes, are traditional during Hanukkah season, so naturally they are also part of the cuisine in Israel, where our food appreciation classes are currently camped on their virtual world culinary tour. But there’s an even better reason to make latkes: kids love not only the process of turning potatoes into latkes, but eating them is a huge treat. 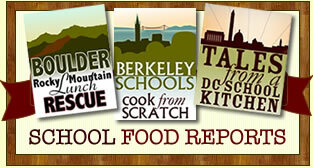 Unfortunately, we don’t have enough latkes for the entire school. 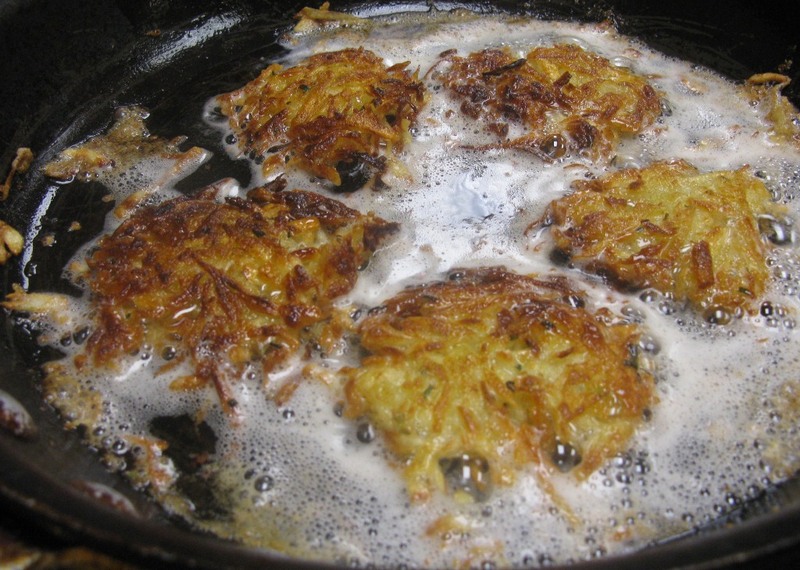 These latkes are especially delicious because they contain parsnip as well as potatoes. The parsnips, which most of the kids had never seen before, add an earthy sweetness. Plus, peeling them gives the kids one more thing to keep their hands busy. 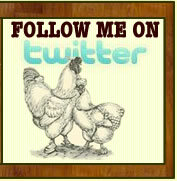 Otherwise the ingredient list is extremely short and the process very easy. First, peel 4 medium Yukon Gold potatoes (or other boiling potato) and grate over the large holes on a standard box grater. Place grated potatoes in a large bowl and cover amply with cold water. Set aside. 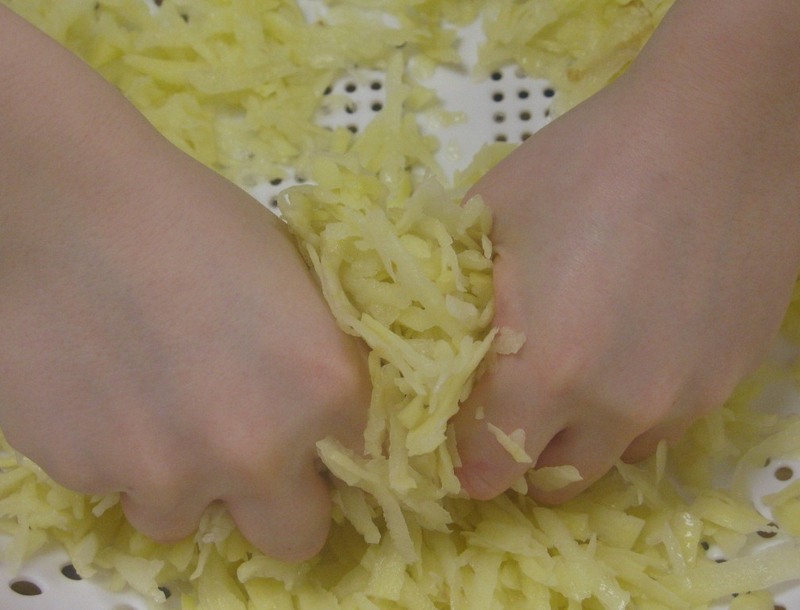 While the potatoes are soaking, peel and similarly grate 2 medium parsnips. Set aside. Drain the potatoes in a colander, set the colander over the bowl and thoroughly squeeze all the water out of the potatoes. They should be bone dry. Discard the water, wipe the bowl clean and mix the potatoes and parsnips in the bowl. Add three beaten egg whites, 2 tablespoons corn starch, a fistful of chopped chives and salt to taste. Mix thoroughly. In a large, heavy skillet over moderately high heat, melt 1/2 stick (4 tablespoons) butter in 4 tablespoons canola oil (or your favorite cooking oil). Scoop out enough potato mix to form a ball somewhat smaller than a tennis ball–about the size of a racquet ball, if you’ve ever seen one. Don’t squeeze, as you will lose the egg whites. Gently lower the ball into the hot oil, then use a heat-proof spatula to flatten it fairly thin. You should be able to fit at least four flattened latkes into a large skillet. 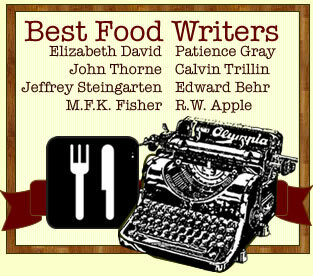 This recipe makes about 1 dozen altogether. Note: young children should not be allowed near the hot oil. We made our latkes on a portable butane burner so that the kids could watch, but they were warned not to get too close. Moderate the heat as needed to brown the latkes deeply, about 7 minutes on each side. Using two spatulas makes turning the latkes much easier. Remove from the pan and drain on paper towels. Continue the process until all of the potato mix has been used. Serve latkes warm with sour cream. 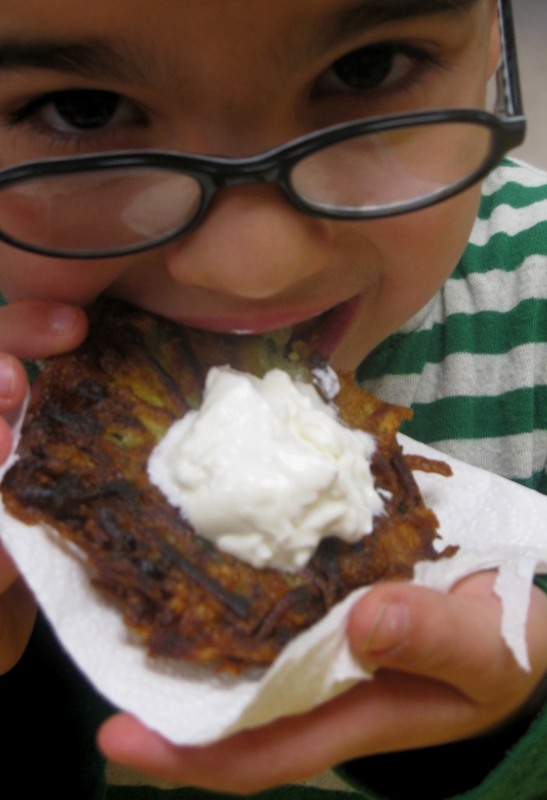 Kids, especially the younger ones, are less crazy about sour cream than they are about latkes. But they should be given the option. It’s tradition!